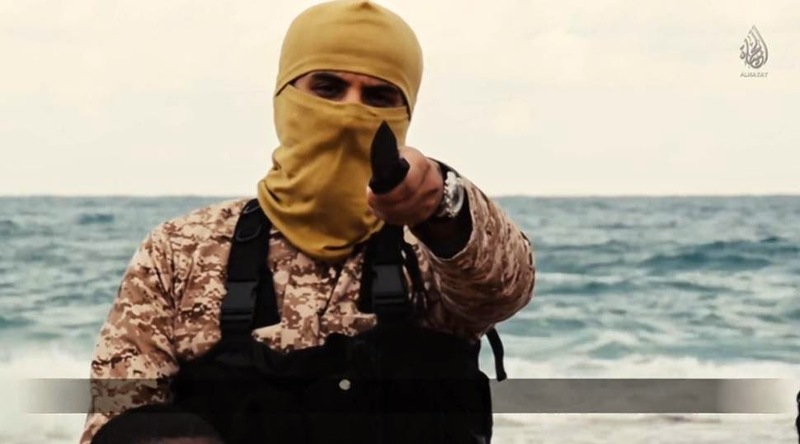 ISIS is flexing its muscle...ISIS is growing and getting more brazen as it moves closer to Europe and creeps ever slowly westward towards America. 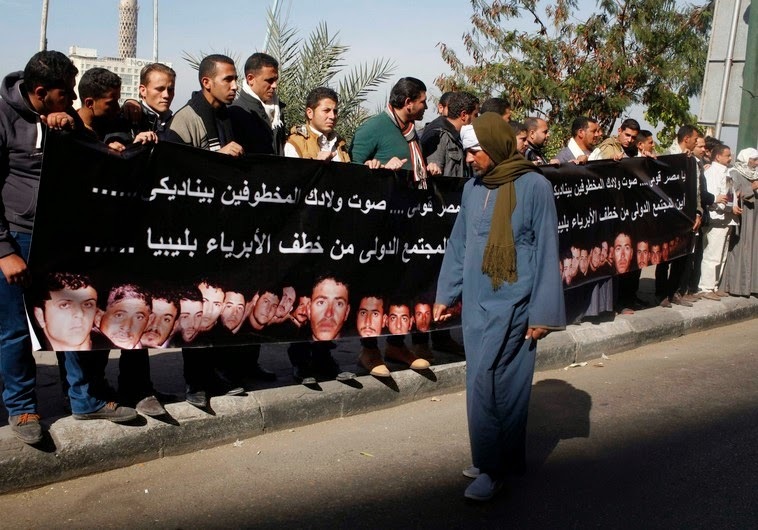 Just days ago twenty-one Egyptian Coptic Christians were lined up in a row and beheaded in a mass execution for NO other reason than their faith alone. 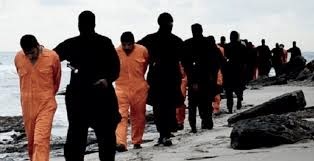 With this action ISIS has turned what was a war of dueling ideologies into a war based upon alluding to the Crusades...with the word 'crusade' now becoming ISIS' justification de-jour for doing what they do. And doing what they do has now allowed ISIS to add the words 'Holy War' to their repertoire. A repertoire that was made public at a Washington D.C. prayer breakfast by none other than ISIS' man in America...Barack HUSSEIN Obama...who brought up the Crusades as he damned Christianity...the very faith he professes to follow. Why bring up the Crusades at a gathering of men and women of faith...why bring up events of a thousand years ago when the enemy we face is a tangible here and now enemy NOT ghosts from centuries ago...why...because he is doing the bidding of those to whom his true allegiances lie. 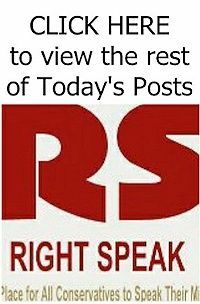 And with Obama giving ISIS the Crusades to use as a shield to hide behind...just like they hide their faces behind scarfs when doing their vile deeds...they now relish in rubbing their ever-expanding reach into our faces as they happily advertise their savagery via YouTube videos for all to see...for all to fear. 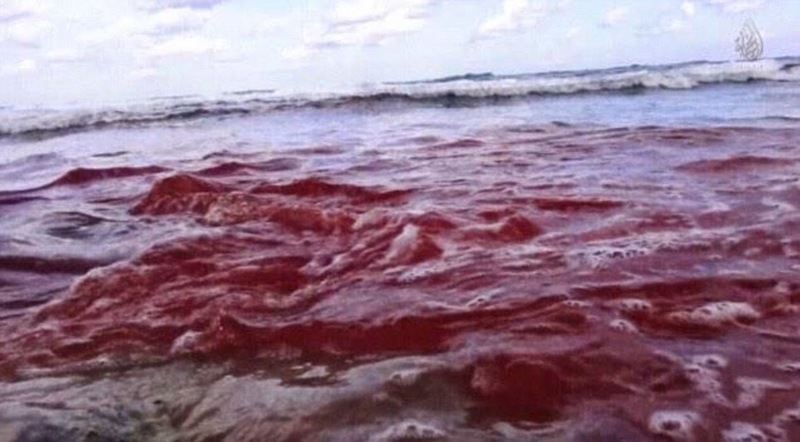 But what of the twenty-one souls whose blood turned the Mediterranean red...the video ISIS released showing the beheadings was beyond the scope of comprehension of civilized men NOT just because of its raw savagery, but with the title of the video reading, “A Message Signed With Blood to the Nation of the Cross,” and with the words "Safety for you crusaders is something you can only wish for," uttered by one of the knife-waving savages before the first throat was slashed...and this time it was NOT the usually expected 'Jihad John'...a modern day Holy War has begun. And while some wonder what the Egyptians were doing in Libya to begin with that answer...like so many other answers to so many other questions...lies at the feet of Barack HUSSEIN Obama...whose anything but an Arab Spring became the catalyst for economic instability throughout the entire Middle East region...instability which forced people to look beyond the home countries for work..to look to oil-rich but manpower-poor countries like Libya. Such was the case for these unfortunate souls...good men just trying to make a living in an area of the world gone mad. Brave souls these twenty-one men were for their last words were words of faith as they were resigned to the fact of their upcoming death. “Jesus help me,” NOT “Jesus save me” they said for they knew saving was NOT to be their fate but helping to 'cross over' without fear was all they asked for. 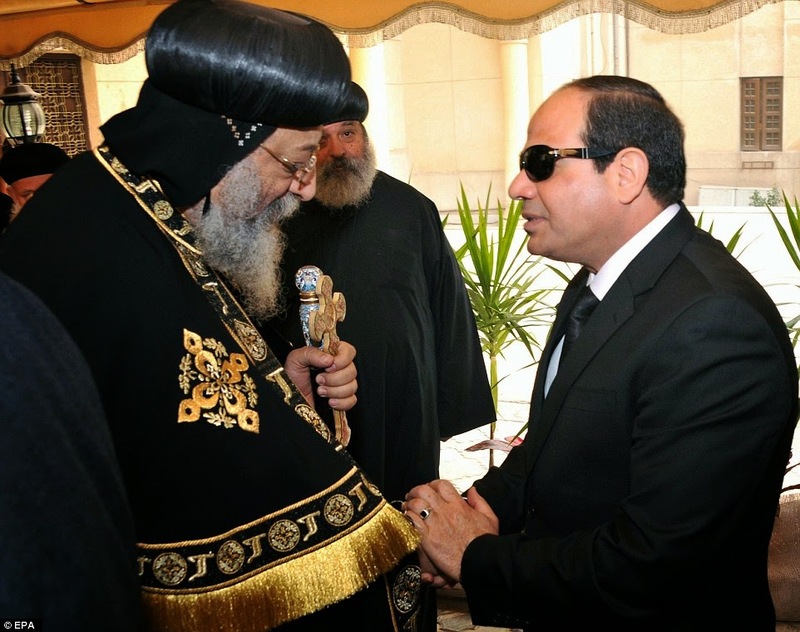 Twenty-one brave souls now with the Lord while thirty-five other Egyptian Coptic Christians are also in ISIS' hands awaiting their fate...a fate which will sadly be at the whim of barbarians. 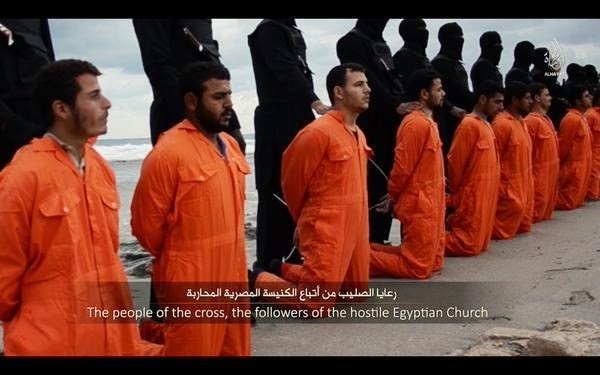 And while Pope Francis condemned the beheadings saying all Christians “be they Catholics, Orthodox, Copts or Lutherans” are of one faith, he proclaimed the murdered men martyrs. But like so many others he too does NOT understand that martyrs are those who willing die for their faith or their cause...martyrs are NOT those whose hands are tied behind their backs so that their death becomes one of lambs to the slaughter. And what of Obama...where were his words of condemnation...I must have missed them I guess. But seriously, all we got was words on paper in the guise of an 'official' statement delivered NOT by Obama himself but by his mouthpiece Josh Earnest, because just like he did after the beheading of James Foley, Barack HUSSEIN Obama was too busy hurrying off to play golf. And even sadder was that the statement issued rang hollow...just like all previous statements issued concerning those murdered by ISIS did...for this statement's wording was also devoid of the all-important words that needed to be said. Those all-important words were again missing...deliberately of course...just like when Obama called the Jews murdered in the kosher supermarket in Paris “random folks,” Earnest's words called those twenty-one Coptic Christians murdered “innocents” or “citizens” with the word 'Christians' NOT written and NOT said. But within the two short paragraphs of this 'official' Obama statement the word 'ISIL' appeared five times...ISIL...NOT ISIS...again allowing Obama to 'officially' give a shout out to his brethren...his brethren who want Israel wiped off the map. And oh yes, no one...NOT one single person in this administration...has said the words 'Jews killed' or 'Christians killed' in any of their TV appearances let alone have they said the words 'muslim islamists terrorists'...and they NEVER will. And now with yet another atrocity having just taken place...an atrocity reflecting the severity and speed of the ever-increasing spread of ISIS...these savages burned to death forty-five Iraqis from the town of al-Baghadi, most of whom were believed to have been part of the town's security forces. And the silence from Obama remains deafening even as local police chief, Col Qasim al-Obeidi, continues to plead for help from both the Iraqi government and from the international community...yet NO real help to date has been forth coming. So as the three-day Obama NOTHING but a photo-op to look like something is being done 'Summit on Countering Violent Extremism' (SVE) begins in D.C...notice the words islamic terrorism are left out even here...representatives from more than sixty nations will...as per Obama's agenda...focus on how to prevent attacks like those carried out by 'lone wolves'...will focus on local ways to discourage and prevent 'discontented' youth from becoming extremists...but will NOT have its prime focus being on ISIS like it should be. And in this administration's refusal to zero in on islam...while they continue to claim that the actions of ISIS do NOT represent islam and that the threats worldwide go beyond any one religion (I'm still waiting for Obama to say what other religion does what ISIS does)...you just know this summit will go NOWHERE and will accomplish NOTHING...exactly what Barack HUSSEIN Obama wants...exactly what ISIS wants...and oh yes...exactly what the puppet master Valerie Jarrett wants...just saying. 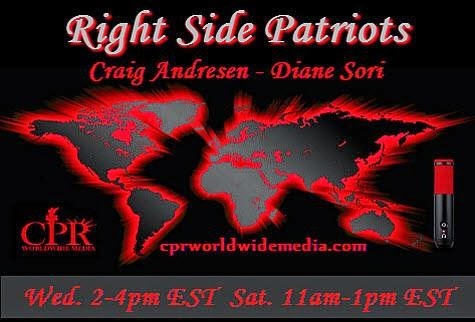 Today, Wednesday, February 18th, on RIGHT SIDE PATRIOTS on CPR Worldwide Media from 2 to 4pm EST, Craig and Diane will be discussing the beheading of the 21 Coptic Christians at the hands of ISIS and Obama's response or lack thereof to this horrific act, and the burning alive of the 45 Iraqi's again at the hands of ISIS.